At the end of the first issue of DC’s comic book based on V (I reviewed it back in February) Mike Donovan, Julie Parrish, Willie the Friendly Visitor and other members of the resistance had crashed in the desert near a small town. Ham Tyler and Chris Farber, meanwhile, were attempting to commandeer themselves a boat. Judging by the cover of issue #2 I would have expected to see a Visitor, fake skin hanging from his slimy green face, threatening to kill a young boy (or girl). That didn’t happen. The cover lied. 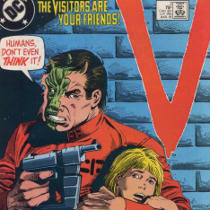 If you look at the cover closely you’ll notice that the Visitor has three large spikes sticking out of his forehead. They were seen in the original miniseries as well (I don’t recall off the top of my head whether the spikes/horns were shown in the sequel miniseries or the weekly series) and I’ve always wondered how they were so well hidden by the fake human skin worn by the Visitors. Were they supposed to pull back into the skull or fold over or something like that? V #2 Cover – Copyright DC Comics Inc. Anyway, the issue opens with a large panel featuring Julie’s bare legs dead center on the page. That’s not subtle at all. Before long, Julie and Mike (and another Resistance member named Hart) discover that the town of Sparkling Springs has a comfortable arrangement with the Visitors. In return for weekly access to the town’s hot springs, the Visitors gave the townspeople crystals that stimulate awesome growth for their plants and offered them rejuvenating medical treatments. What a bargain. As for Ham and Chris, they overwhelm a few drug runners and find themselves the owners of a shiny boat filled with weapons. They fight off four flying Visitors (they use jet packs that were never shown in the series) who then return on a flying platform (also never seen in the series) and blast the boat. So, Ham and Chris plant some plastic explosive and dive overboard. The boat goes boom and most of the Visitors are killed. But not Lorne, their leader, who is working for Nathan Bates. As the issue closes it looks like Lorne is going to get his comeuppance. The fine folks of Sparkling Springs imprison Julie, Mike and Hart for “their own good” because the Visitors will be arriving in the morning. Unfortunately for all involved the Visitors decide to show up early! That can’t be good. I’m excited to see what happens next. Can Willie and another, unnamed Resistance member rescue Julie, Mike and Hart? Will the springs of Sparkling Springs be destroyed so the Visitors can no longer benefit from them? Will Ham and Chris kill Lorne or use him to get to Nathan Bates? We’ll have to wait to find out. One last note: on page 17 after blowing up the boat, Ham and Chris swim away. Ham thinks to himself “As my hero on TV likes to say…I love it when a plan comes together!” Ah, a reference to The A-Team in a comic book based on V. It’s 1980s synergy.